Thank you for visiting Certified Auto Center of Wausau, WI, powered by Carsforsale.com. Quality used cars and trucks. Check out our inventory and contact us if you have any questions. two profiles were found for Certifiedautocenter.net in social networks. Among other social networks the website is represented in Facebook and YouTube. 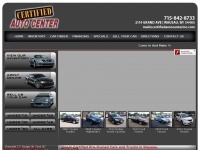 The web server used by Certifiedautocenter.net is located in USA and run by CarsForSale.com. There are many websites run by this web server. The operator uses this server for many hosting clients. In total there are at least 143 websites on this server. The language of these websites is mostly english. The Certifiedautocenter.net websites were developed using the programming language ASP.NET and served by a Microsoft-IIS server. For managing the data of the webpages the CMS DotNetNuke is used. The website uses the latest markup standard HTML 5. To analyze the visitors, the websites uses the analysis software Piwik. The website does not specify details about the inclusion of its content in search engines. For this reason the content will be included by search engines.